After a glorious ten day vacation of eating at wonderful restaurants three meals a day I was missing the excitement and satisfaction of creating my own meals. Enjoying meals in restaurants is fun, but it can’t replace the experience and satisfaction of creating your own. 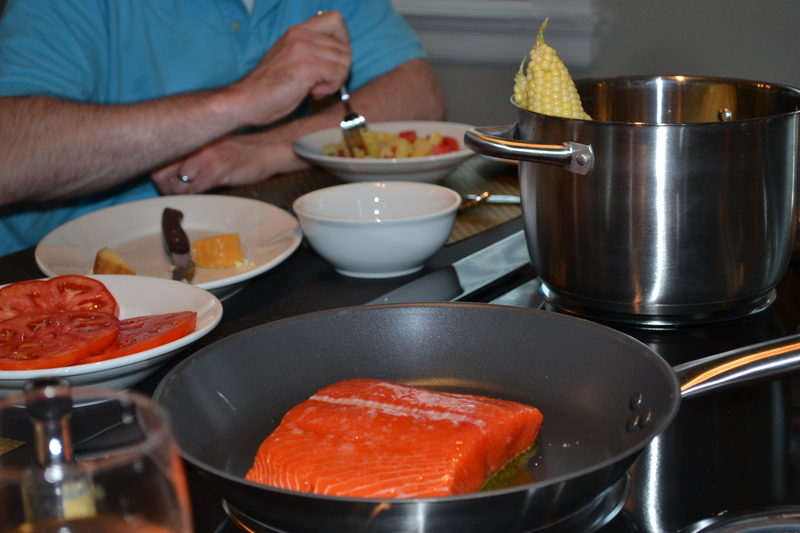 The final day of our trip in McMinnville, we decided to cook in the well equipped kitchen of our hotel room. 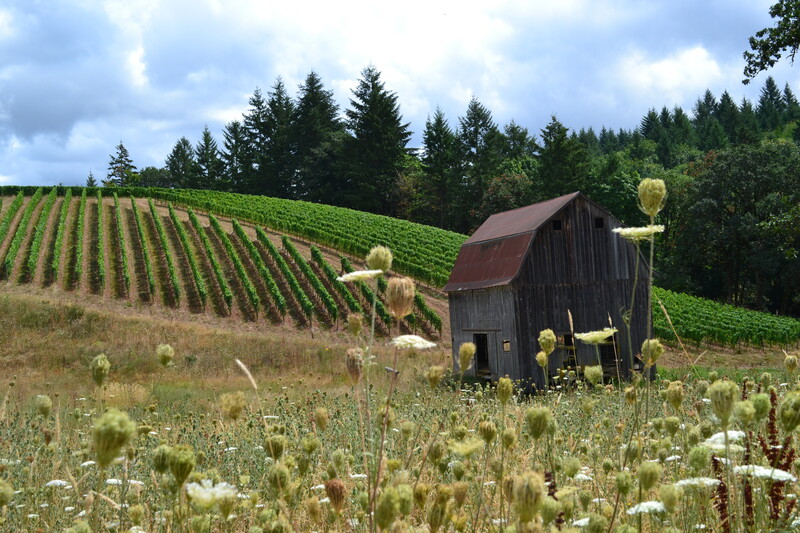 We struck out across the beautiful hilly landscape of the Willamette Valley to look for local markets to collect our bounty for the evening meal. There was no menu in mind, just a desire to see what ingredients the valley had to offer us. 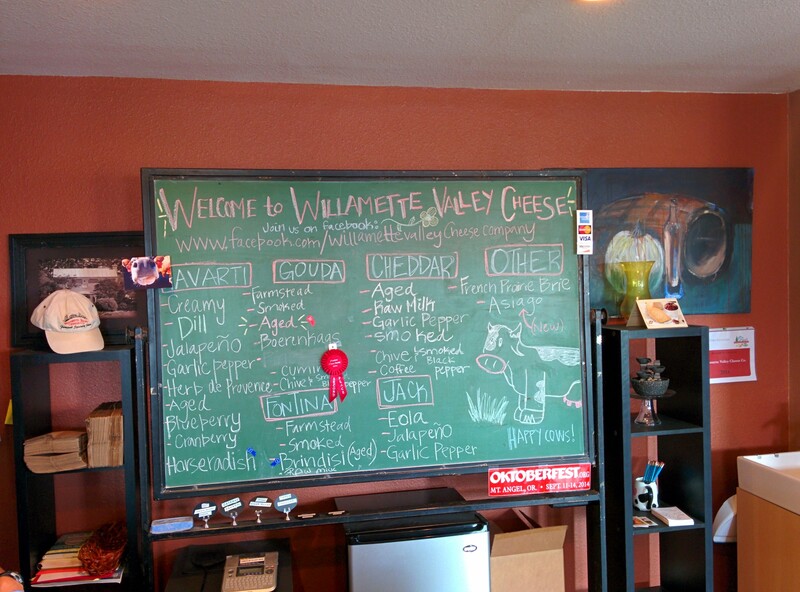 First, we happened across the Willamette Valley Cheese Company, a small dairy tucked just off a main highway. Entering the property took us past grazing goats on one side of the road and cows on the other. 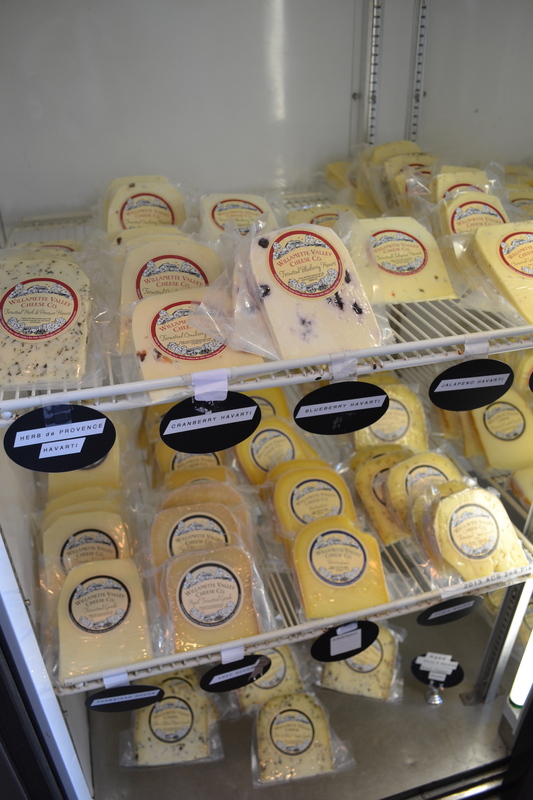 The dairy has a small store and offers tastings of all the cheese they sell. We had great fun deciding which cheese we wanted to start our meal with even though we had no idea yet what our meal would be. Finally, we settled on smoked fontina and smoked gouda as possible appetizer ingredients. With appetizers covered we moved on to the wine. 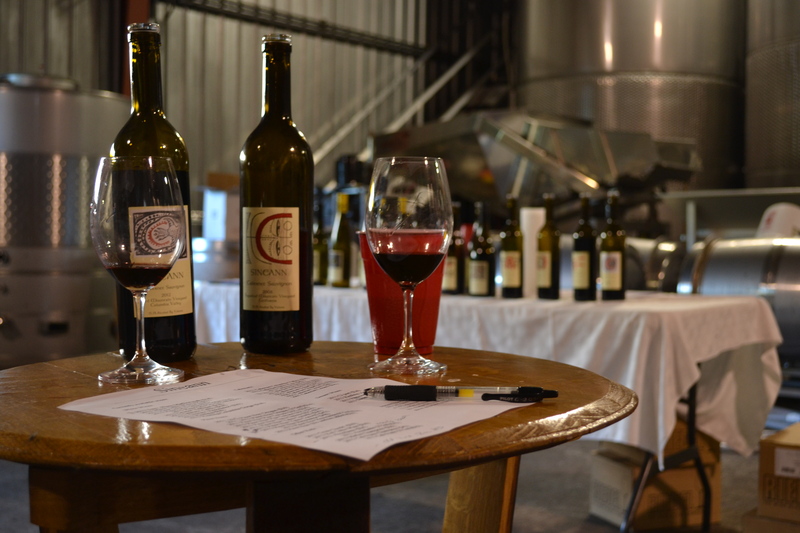 We visited four wineries and thoroughly enjoyed them all starting with Colene Clemens Vineyards. 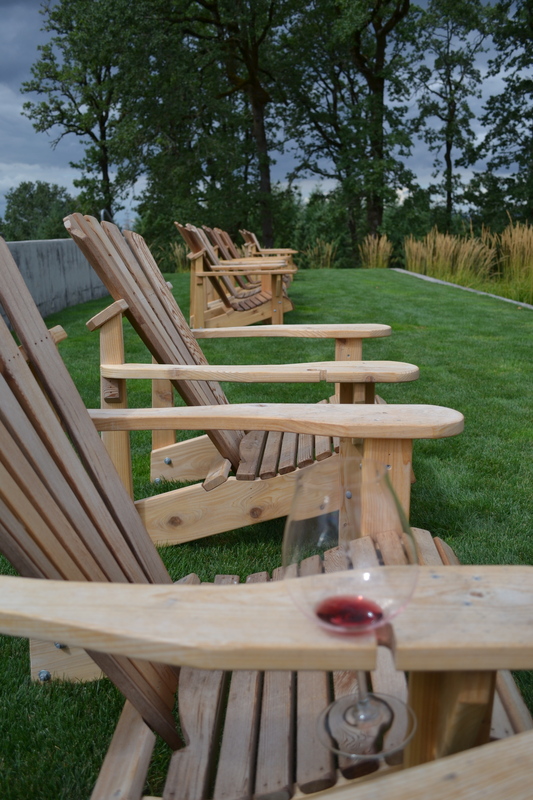 The vineyard has a beautiful patio tasting room overlooking the valley bellow. We enjoyed all the wines, and purchased a few, and settled on the 2013 Rose of Pinot Noir. It has crisp and rich flavors that would be strong enough to stand up to any meal we decided to make. As we moved through the other wineries we picked up lovely bottles to bring back for future dinner parties at home. 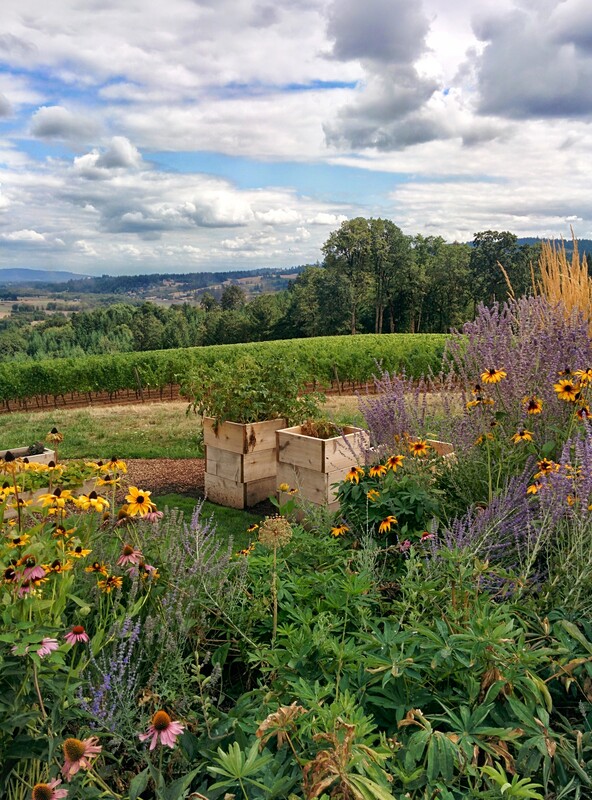 Equally stunning views and delicious wines were found at Penner-Ash. This is a lovely spot to bring a picnic lunch or just sit and relax while enjoying their extensive cellar. I especially recommend their 2012 Estate Vineyard Pinot Noir. It is perfect for light summer meals. 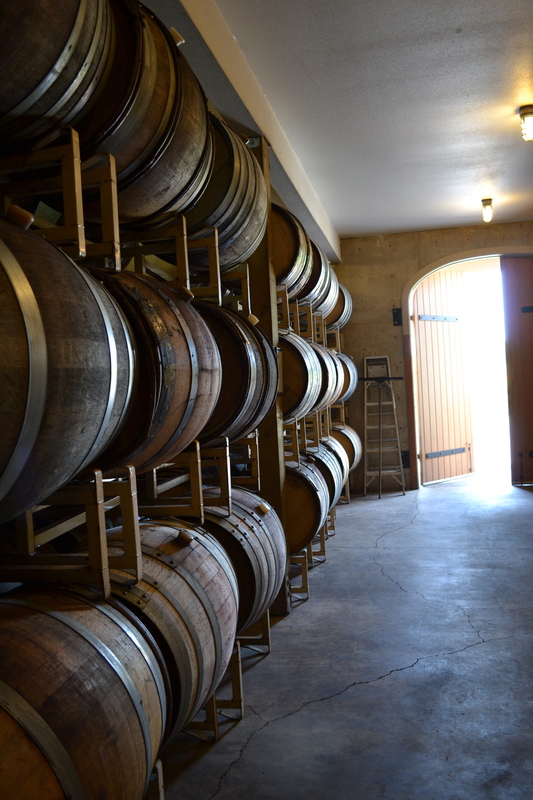 We had great fun finding and tasting the wines at Sineann, my favorite winery in the valley. The variety we brought back, Pinot Noir 2012 will go well with a variety of recipes. Besides the wonderful flavors of their wines, they use glass corks which allow you to easily re-cork any bottle you haven’t finished, and keep them for future wines. As we tasted the wine and had lovely conversation with the proprietor at Ayres Vineyard in Newberg, she recommended we head into town and visit Northwest Fresh Seafood Company. They had wonderful wild salmon and calamari steak. 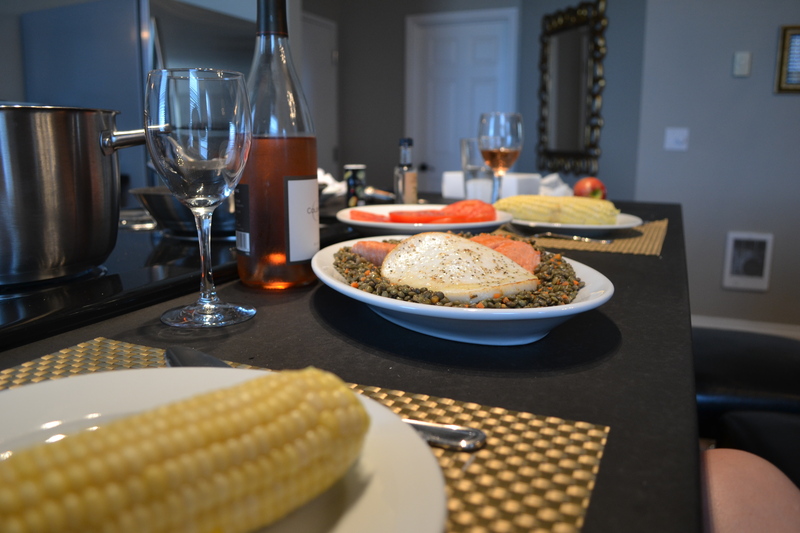 Our meal was coming together! Hostess Tip: pack a small cooler and some frozen cold packs to store perishable provisions in your car (a Styrofoam disposable cooler works perfect for road trips). As we made our way to the fishmongers, we found a farmer’s market nearby. They had fresh sweet corn and tangy tomatoes that we purchased. Although we were getting ingredients for dinner, I couldn’t resist buying juicy northwest blackberries and cherries for breakfast the following morning. 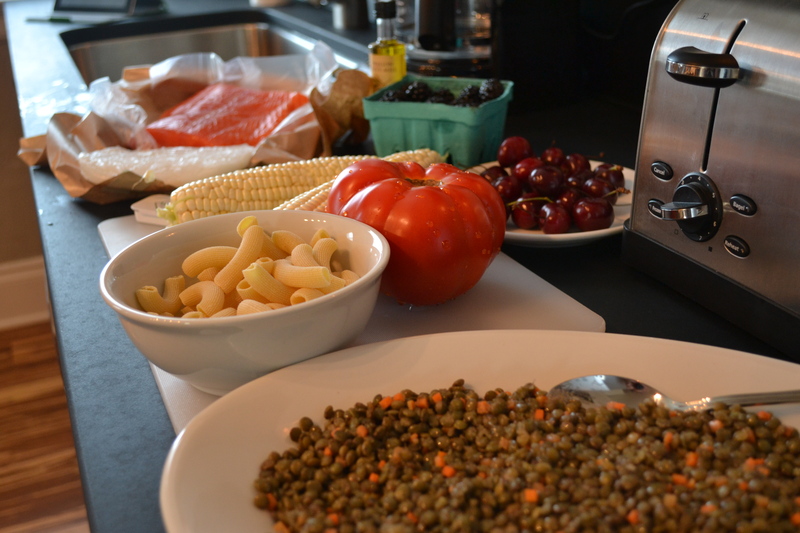 For the final touches we headed back to McMinnville to gather finishing salt, pepper, crackers for the cheese, some fresh pasta, olive oil, and some lentil salad. The only thing missing was dessert. Happily, Honest Chocolate in McMinnville offers a very large selection of delectable and unique chocolates, minutes away from our hotel. We chose a selection of chocolates, ranging from hand crafted peanut butter cups, caramels sprinkled with sea salt, and honeycombs covered with chocolate. Of course we bought more then we needed, but we enjoyed the left overs on the flight home! Hostess Tip: when traveling, keep an eye out for quality and healthy food that you can enjoy on the plane ride home. I keep some zip looks bags in my purse to keep them fresh. Odds are this practice will allow you to have better food on your flight then you can buy in an airport or on a plane. Once back at our hotel we enjoyed the benefits of a fully stocked kitchen to prepare our feast. The first step, turning on some music to set the mood: I choose 1940s standards. 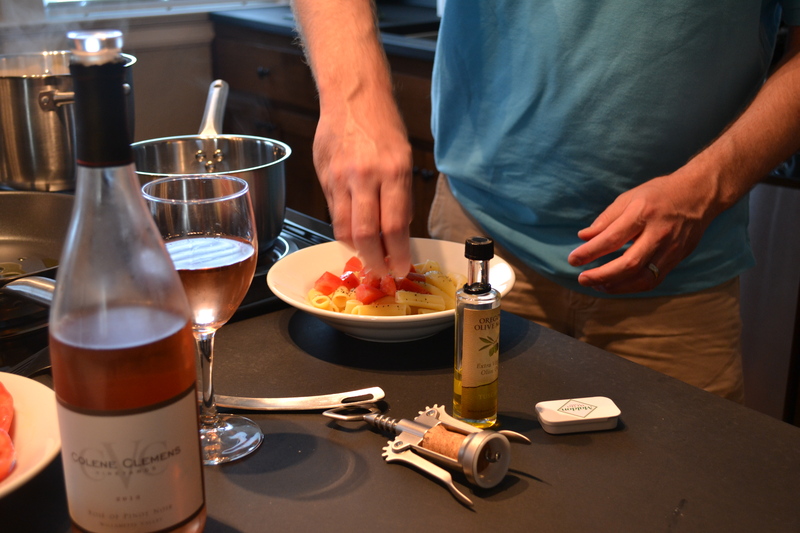 Then we opened the wine, set out the cheese and crackers and started cooking! The evening was a great success and a much needed break from eating out. It was a wonderful way to share our memories about our trip as it wound down and cook together. Bring a pot of water to a boil at high heat and and add corn. Cook for about 3-5 minutes, until water is boiling once again and remove immediately from water. Fill the pasta pot with water and bring to a boil. Add the pasta and cook until al dente, about 5 minutes. Remove from water, season with olive oil, salt, and pepper. Add some cheese from your appetizers and diced tomato. Serve with dinner or in lieu of a salad. 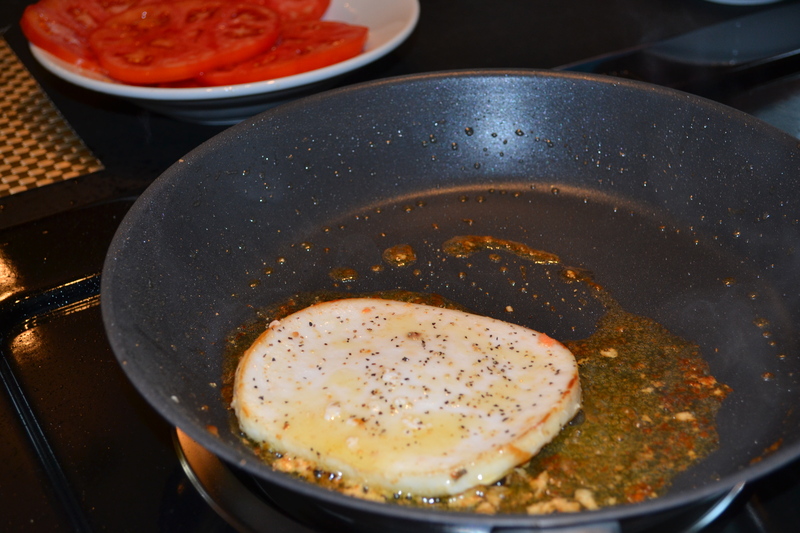 Just coat the bottom of the frying pan with olive oil and heat over medium. Rub both sides of the salmon with salt and season with pepper. 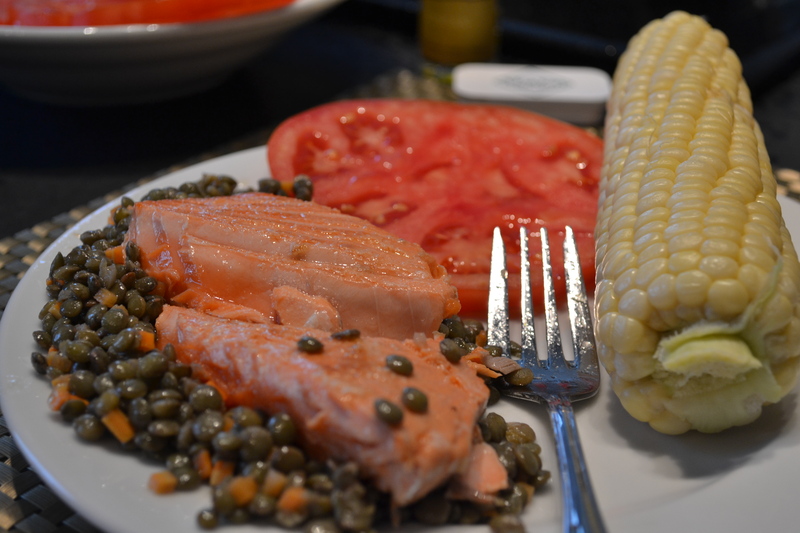 While the salmon is cooking slice the tomatoes. Hostess Tip: add some mozzarella and fresh basil is you can find it. Place the calamari in the frying pan already seasoned from salmon. Cook for about 2 minutes per side, until the side of the calamari just curl up and the fish is lightly browned on the edges. 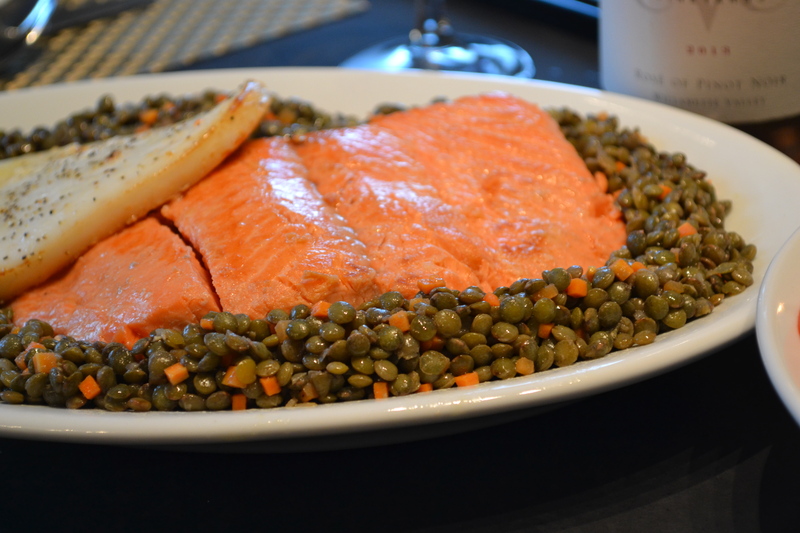 Place the lentil salad on the platter and arrange the salmon and calamari on top. Serve the tomato salad on a separate, smaller, serving platter. Divide the pasta into small individual bowls at each place setting. Place one corn cob on each plate. Place all the chocolates on a plate for display or eat right out of the box, as we did. Do those glass corks ever break during transport at the airport? The glass corks are quite resilient. I kept ours in my carry on which secured its safe travel. From personal experience, however, I have learned it is best to pack wine bottles in appropriate shipping materials and check them with the airline. It ensures your wine and your clothing get home unscathed.